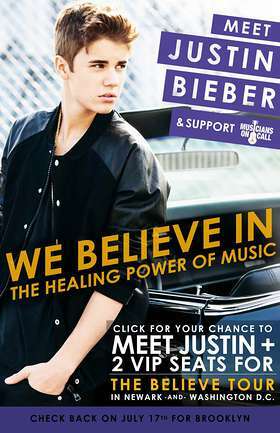 Musicians on Call believes in the healing power of music and so does global icon Justin Bieber! As part of his ongoing support of the organization, Justin has donated ‘VIP Experiences’ for all cities his Believe Tour hits this summer where Musicians On Call has Bedside Performance Programs! A few of the cities were auctioned off earlier in the summer, and now they’re launching more. As always, all funds raised through these auctions go directly to help Musicians On Call expand their programs – so they can serve more patients, in more hospitals, in more cities, nationwide. With worldwide album sales in excess of 16 million units, Justin Bieber has dominated pop culture and social media for more than four years. He has over 53 million Facebook fans, more than 39.3 million Twitter followers, over 3.3 billion views across VEVO, and is far and away the most popular YouTube artist of all time, being the first to hit 3 Billion views! Justin’s most recent release, ‘BELIEVE ACOUSTIC’ was #1 on iTunes in over 63 countries (including the U.S.), following on the heels of his #1 debuting album ‘BELIEVE,’ which dominated the charts for most of 2012. The only artist in history to have five #1 albums before turning 19, Justin is a huge superstar with an even bigger heart. When he mobilizes his army of Beliebers as a philanthropic force, they make quite an impact. Justin chose Musicians On Call as one of the charitable beneficiaries of the ‘Believe Charity Drive’ which accompanied the release of his ‘Under the Mistletoe’ album in 2011; and thanks to Justin’s generosity and the Beliebers, the resulting donation enabled Musicians On Call to expand their programs to Los Angeles, where Justin currently resides. Justin’s subsequent support of Musicians On Call led to the expansion of these programs, and now, he’s helping them out once again during the Believe Tour! Don’t miss your chance to meet Justin, see his incredible show and help Musicians On Call share the healing power of music. To bid on tickets to his Newark, NJ and Washington DC shows, click here. An auction for the Brooklyn show starts on July 17.